As the Ottawa Senators packed up and met with the media for the last time this season, Ottawa Senator's Captain Daniel Alfredsson remained tight lipped about whether he will return in the Fall. 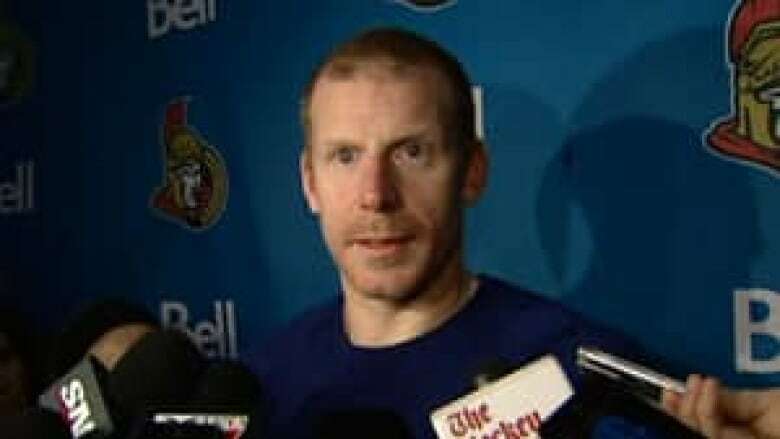 As the Ottawa Senators packed up and met with the media for the last time this season, team captain Daniel Alfredsson remained tight-lipped about whether he will return in the fall. "Now it's just enjoy some family time and probably take at least a week before I even allow myself to think about it and go from there," said Alfredsson. He said his one remaining goal as a professional hockey player is to win the Stanley Cup. Alfredsson's teammates said they will respect whatever decision he makes, but some openly declared their preference. "We're all just praying he comes back," said Senators forward Kyle Turris. If Alfredsson doesn't take his place on the players' bench next season, the club has long said he will almost certainly return in some role behind it. Many players were on their way home after their dreams of winning the Cup this season were dashed following a five-game, second-round loss to the Pittsburgh Penguins. Senators star centre Jason Spezza revealed Monday that he has been suffering from more than a herniated disc in his back. He said towards the end of his post-surgery rehabilitation, he suffered a torn meniscus while skating. The meniscus is a cartilage pad that acts like a shock absorber between upper and lower leg bones in the knee. He said that set back his recovery, but he doesn't regret returning to play when he did. Spezza underwent surgery on his back after playing just five regular-season games and did not return until Game 3 against the Penguins. Spezza said he will undergo arthroscopic surgery on his knee in the coming weeks, but his focus remains getting his back repaired. It's common for players and teams to keep quiet about the full extent of injuries, especially during the playoffs. Senators head coach Paul MacLean and general manager Brian Murray will hold their end-of-season media conference on Tuesday.